Some will call it a defensive battle. Some will call it bad basketball. I'll go with the latter. Talor Battle was held to 8 points, shooting just 3 of 15 from the field while missing all five of his 3 point attempts. This game had ugly written all over it. The Lions had just 22 points at the half and they were even worse in the 2nd half. Temple wasn't much better. The Owls would go on to shoot just 26% in the 2nd half and still managed to win. 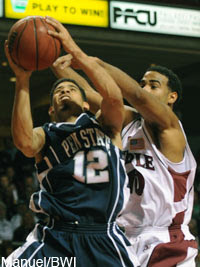 Penn State had a chance to tie the game but couldn't get a shot off in the final 30 seconds. Yikes. Up next is UMBC Tuesday at 6:30. The game is on the Big Ten Network. Tune in to watch this team continue to confuse us.